By the mid-nineteenth century, there were several stores in town selling ready-made and custom-made clothing to the citizens of New Orleans. Proprietors of dress shops and men’s furnishings stores made regular trips to fashion centers in the United States and abroad to purchase the best stock in the latest styles. Madame Olympe, the preeminent dressmaker in New Orleans, journeyed to Paris every year to bring back textiles, accessories, and trained dressmakers. 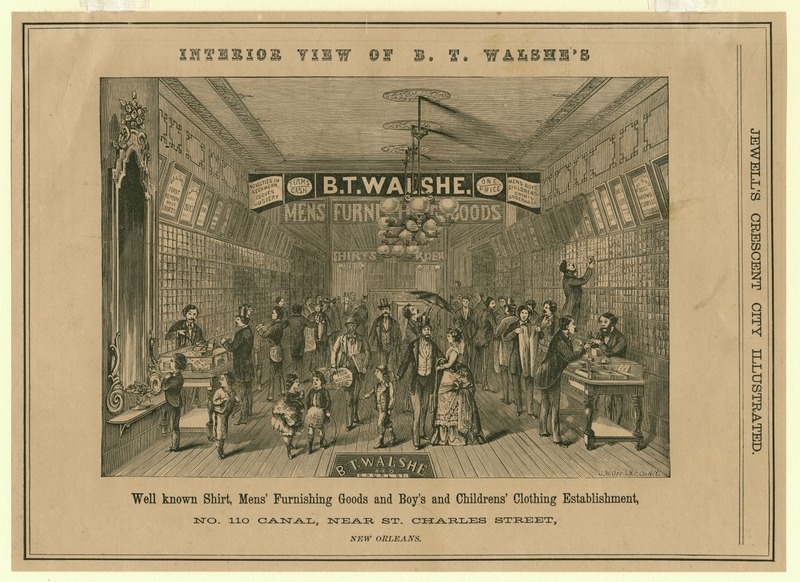 The clothier and furnisher B. T. Walshe regularly traveled to New York to buy the original stock for his store. By the turn of the twentieth century, there were stores that specialized in linen suits, hats, and sturdy shoes—the items necessary for dressing fashionably in the hot, damp city.